From the first moment we slide into the driver’s seat, we’re warned of the dangers of the road, not the least of which is to beware of hitchhikers. However, when the hitch is on the other end and we find ourselves stranded, forgive the pun but the other rule of thumb is to be ever so careful of the people from whom we accept a ride. This is infinitely more suspenseful when the car is replaced with a sailboat and one finds themselves in the middle of nowhere on a picturesque yet eerily quiet lake, unsure wherein the ultimate jeopardy lies whether it’s in the perils of the voyage or in neglecting to follow the rules of stranger danger ingrained in us as children. In most films, it’s the down-on-their-luck loners we find ourselves most concerned with whether it’s Billy Zane terrorizing Nicole Kidman in Dead Calm or the kill-you-with-kindness menace lurking just below that bland smile in the brilliant French thriller With a Friend like Harry. 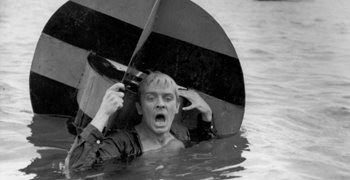 However, upon revisiting the gorgeously remastered cinematic debut from Polish filmmaker Roman Polanski with his anxiety laden, three-character stunner Knife in the Water, we’re never sure if the danger lies within the hearts of either the mysteriously nameless, young, blonde hitchhiker (Oskar Werner look-alike, Zygmunt Malanowicz) or the bourgeois couple with whom he finds himself traveling, including the aggressively boorish and antisocial Andrzej (Leon Niemczyk) and his visibly younger wife Krystyna (Jolante Umecka). The film opens in sheer cinematographic bliss as Krystyna drives her husband down a deserted road as the shadows from the leaf-filled trees dance peacefully upon her windshield in crisp black and white punctuated with a sultry jazz score from saxophonist Bernt Rosengren. The tempo changes with a jolt as her husband demands his chance at the wheel. Obviously while one foreshadows the subtext about emasculation and male rivalry given the film’s title, possibly our first indication that Krystyna’s domineering husband is in an irrational, virility-driven midlife crisis occurs as soon as he gets into the driver’s seat. Soon the exquisite beauty of the film’s photography switches to cool, masculine, straightforward lines with a subtle, classical, old-fashioned score that is quickly forgotten when he slams on the brakes, nearly hitting the nameless deserted Young Man (Malanowicz) precariously standing in the middle of the road. The fact that he refused to slow down earlier, preferring to wield his lethal power over a harmless, ill-equipped stranger says a lot about our wealthy lead. Trained by the predictability of suspenseful dramas, we worry that the Young Man will soon receive his comeuppance when he’s not only offered a ride with the two but also—with no particular place to go and an even vaguer timeline—is impulsively invited along for their overnight sailing excursion so that he can ride with them again in the morning. However, he’s not as naively innocent as one would assume. From the moment his rucksack hits the backseat of their car, he and Andrzej engage in petty male rivalry and one-upmanship subconsciously more to challenge one another than to garner the attentions of the female in their midst; the Young Man agrees to come along, noting that his elder wishes to continue “the game.” Dismissing this charge with a snobbish, “You’re not in my class, kid,” Andrzej doesn’t heed his own warning, proceeding to do everything in his power to toy with the lad. Intriguingly, Polanski — fully aware of the way that men try to prove their virility in the company of women more out of sport than genuine affection — makes a choice that proves maturity beyond his young years just fresh out of film school, to allow his amateur actress and leading lady to first appear onscreen looking like a complete schoolmarm. As he notes in an eye-opening video introduction on the Criterion disc, the notorious storyboarding director Polanski cleverly depicted Krystyna in an unflattering light, initially hiding her eyes behind pointed glasses, her greasy hair up and body completely covered. This makes it much more effective as she grows progressively more dazzling from the moment her feet touch the deck of the sailboat, when the glasses come off, hair blows free, excess clothes are removed and we witness the shapely beauty that—without her intention—propels the foolish men to an unexpectedly violent yet inevitable confrontation over the course of the next twenty-four hours. Expertly Polanski used his modest means as a first-time filmmaker to tremendous effect at what must have been a continuity nightmare to get every reaction shot just right in working with the unpredictability of the weather along with the vast inexperience of everyone involved. Indeed, Polanski and his co-writers note on the disc that they acted out the script amongst themselves, writing it over the course of five nights. Amazingly, although it was filmed more than a year later as they had to contend with objections of the government that the film wasn’t propagandist enough and far too “western minded,” it retains this fresh, authentic, and impulsive vibe much enhanced by the radical jazz score (another musical form frowned upon in Poland at the time). However, perhaps its greatest artistic decision came from co-writer Jerrzy Skolimowski’s ingenious effort not to let their limited budget become a hindrance, using it beneficially by paying homage to the Greek dramas he loved that all consisted of the bare minimum of characters, set in the same location over a condensed period of time such as Knife’s twenty-four hour time span. The film, which hasn’t lost its ability to surprise and keep us riveted by the tense psychological testosterone-fueled warfare—all driven by subtle Hitchcockian male gaze and the fact that the two rivals are far more similar than they’d like to admit—is one of the director’s very best works. Now given the double-disc luxury treatment from Criterion complete with Polanski’s participation and including several of his student films, I’d even go as far as to say that Knife in the Water holds up better than any of his other 1960s offerings including the excellent yet dated Rosemary’s Baby. Although it will never top his masterwork Chinatown, Knife in the Water, which became the first Polish nominee ever included in the Best Foreign Language Film Category of the Academy Awards (predictably losing to Fellini’s brilliant 8 & ½), introduced international audiences to the director’s most frequently visited themes and inspired two more psychological ménage a trois films in a “loose trilogy” including the director’s Cul-de-Sac and the chilling Death and the Maiden. In addition, those who know anything about the tragic biography of the filmmaker (who would later go on to make the intensely personal Oscar winning World War II film, The Pianist) will be greatly amused by IMDb’s inclusion of the popular rumor that the sailboat in Knife may have indeed been formerly owned by one of Hitler’s close friends, the Nazi party member Hermann Goering, which makes the setting of such primal male rivalry seem all the more fitting.